ORIGINAL TRADE PAPERBACK. SEQUEL TO COBRA SLAVE. 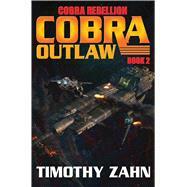 New York Times #1 best-selling author Timothy Zahn continues his Cobra SF adventure series with book #2 of a new Cobra saga, Cobra Rebellion. Cobra warriors: technologically enhanced and implanted with an arsenal of covert weaponry fight against alien foes and evil humans. Timothy Zahn is a Hugo award winner, and author of the #1 New York Times best seller Heir to the Empire. Born in Chicago, Zahn earned a B.S. in physics from Michigan State University and an M.S. in physics from the University of Illinois. He sold his first story to Analog magazine in 1978, and immediately attracted attention as a new writer of science fiction based on real, cutting-edge science. Other Zahn creations include the Conqueror and Dragonback series. His books for Baen include his popular Cobra SF adventure series. Zahn is also the coauthor, with David Weber, of new Honor Harrington universe series Manticore Ascendant, with first entry A Call to Duty, out in October 2014.